The operatives of the Nigerian Police have apprehended a company driver, identified as Abiodun Idowu, after he killed a female worker, Abimbola Hamzat, during an alleged attempt to forcefully sleep with her. According to reports, the sad incident reportedly occurred on May 29 in a pure and table water factory at the Onipanu corridor of Ota, the industrial town in Ado-Odo-Ota Local Government Area of Ogun State. It was gathered that Idowu, who had been labouring to woo Hamzat (an accountant of the water-packaging factory), for romantic affairs without success, resumed work on the fateful day and met her alone in the factory. The suspect allegedly pounced on the unsuspecting lady in an attempt to overpower her and have his way. Hamzat reportedly struggled to free herself from him but Idowu strangled her to death in the attempt to force her to the ground. It was learnt that the suspect attempted to drink a mixture of Izal liquid disinfectant and Hypo bleach, and the concoction knocked him out. Security operatives who were there to arrest him, found him unconscious and rushed him to a hospital, where he was revived. In a statement released by Police spokesman Abimbola Oyeyemi, yesterday in Abeokuta, the state capital, the Assistant Superintendent of Police (ASP), said the suspected was arrested following a complaint lodged by the owner of the factory, Owolabi Moses. The businessman was said to have reported the incident at the Onipanu Division of the Ogun State Police Command. The statement said: “The arrest of the suspect followed a complaint by Owolabi Moses, who reported at Onipanu divisional headquarters, that the suspect, who is a driver in his pure water factory, had been disturbing the deceased, who was an accountant in the same factory, for a love affair of which the deceased had been refusing his advances. 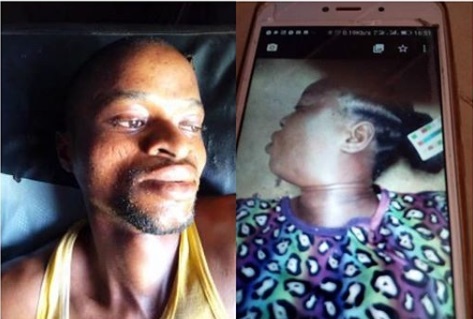 “He stated that on that fateful day, the deceased was alone in the factory when the suspect came in and attempted to forcefully have carnal knowledge of her. While the victim was struggling with him, he strangled her to death.